Taiwan’s national development and financial supervision authorities have announced policy support for turning the country into a global blockchain industry hub, and a separation principle will be adopted in supervising the blockchain and digital currency operations to effectively boost Taiwan’s competitiveness in achieving the goal. At the 2018 Asia Blockchain Summit held in Taipei July 2, both National Development Council (NDC) minister Chen Mei-ling and Financial Supervision Commission (FSC) chairman Wellington Koo highlighted Taiwan’s long-term support for the development of blockchain technologies and shared the view that blockchain as key digital transformation infrastructure will drive the fourth industrial revolution. Speaking at a gathering of over 2,500 blockchain technology specialists and investors from around the world, Chen said that blockchain applications have been expanded from cryptocurrencies to non-financial areas such as smart cities, industry supply chains, energy management, digital entertainment and public management, prompting governments of many countries to enforce strategies to better utilize digital bonus generated by blockchain technologies and to nip potential risks in the bud. Chen said that while pursuing digital economy and transformation, the government in Taiwan will encourage the development of the blockchain industry and help businesses incorporate blockchain technologies to accelerate industrial upgrades. She stressed that with sufficient ICT talent supply and comprehensive ICT supply chains, Taiwan boasts very good infrastructure for the development of blockchain technologies and applications, adding that Taiwan tech startups have launched a variety of innovative blockchain-based solutions, including those for agriculture produce traceability system, music copyrights management, hotel management system, and green power generation and storage. Besides using angel investment funds to support the development of optimized blockchain ecosystems and allowing expanded applications of open data and big data for industrial uses, Chen continued, the NDC will join forces with Asia Blockchain Alliance to develop new blockchain application fields, aiming to help private businesses roll out turnkey solutions for exports and realize the vision of Taiwan as a global blockchain development center. For his part, Koo said that the FSC has been supporting the development of FinTech and will encourage Taiwan financial firms to incorporate blockchain technologies into financial services to create new service values and upgrade service efficiency. Koo stressed that as long as innovation risks can be well controlled and managed, the FSC will allow maximum space for FinTech applications, so as to facilitate the establishment of Taiwan as a solid base for innovations. He also disclosed that the FSC will move to relax related restrictions to create friendly environments for electronics payment operations, and will revise related rules and regulations to facilitate the establishment of two pure online banks. 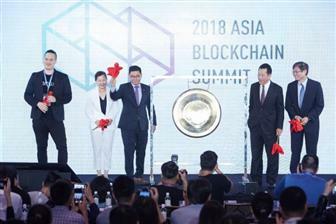 Meanwhile, lawmakers YJ Hsu and WJ Yu also revealed at the summit that they will jointly promote the establishment of a blockchain industry self-discipline alliance and push for currency/blockchain separation campaign to attract global blockchain investors to set up operations in Taiwan and create new economic growth momentum.